For reasons which aren't worth going into now, I'm reading through a recent report by Deutsche Bank Global Markets Research entitled "From The Golden To The Grey Age" this afternoon. The report (all 100 pages of it, many thanks to researchers Jim Reid and Nick Burns who produced the thing) looks at the extent to which a variety of macro indicators - like GDP growth, inflation rate, equity yields, etc - may have been influenced by demographic forces over the last 100 years or so. It is certainly one of the most systematic reports of its kind I have seen, and well worth losing a Saturday afternoon to read. But in the middle, there is an argument which caught my eye, and I thought it worth reproducing. Basically the starting point is this chart, which if you haven't seen by now (or something like it) I'm not sure where exactly you've been during the last 2 or 3 years. Obviously, just the most cursory of glances at the thing should lead even the most untrained of eyes to get the point that what is going on around us is not some passing phenomenon, and that there are deep structural factors at work. 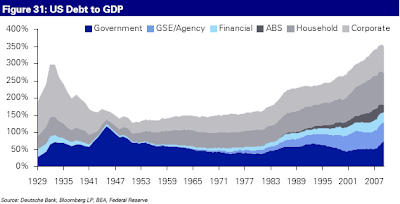 As can be seen (from the above chart) there was a step change in the US economy’s indebtedness from the early 1980s onwards and then an additional one in the late 1990s/early 2000s. A similar picture is apparent across most of the Western World. Basically from the early 1980s to the onset of the Global Financial Crisis the economy added on more debt every year and business cycles were extended as a result. Indeed the Fed and Central Banks around the world were afforded the luxury of operating in a secular falling inflation regime (globalisation) that allowed them to cut rates, further allowing the accumulation of debt, every time the economy may have naturally been rolling over into a normal recession consistent with those seen through history. This debt accumulation undoubtedly helped smooth the business cycle and contributed to the period being known as the ‘Great Moderation’. This period came to a spectacular end with the onset of the crisis and it is possible that going forward we will revert to seeing business/credit cycles more like they were prior to the ‘Great Moderation’. Now here comes the clever part. Our researchers then go on to take a look at the the average and median length of the 33 business cycles the US economy has seen since 1854. For the overall period they found the average cycle from peak to peak (or trough to trough) lasted 56 months (or 4.7 years). However, the averages are boosted by an occasional elongated "superbusiness cycle", and thus the median length is a much smaller 44 months (3.7 years). As they comment, such numbers must look very strange to those who have only ever analysed business cycles over the last 25-30 years. Within these 33 cycles the contraction period lasted 18 months on average or 14 months in terms of median length. This equated to the economy being in recession 31% or 32% of the time depending on whether you look at the averages or the median numbers. Taking just the period before the “Great Moderation” the average US cycle lasted 5 months less at 51 months (or 4.3 years) with the median at 42 months (3.5 years). Over this period the US economy was in recession 35% and 36% of the time respectively depending on whether you look at averages or the median. Now we used to think that all of that was behind us, but then we used to think that the "Great Moderation" had gotten things under control, and not simply temporarily extended the cycle length by facilitating long-term-unsustainable levels of indebtedness. So in fact, given that, as they say some sort of cycle or other has been with us since at least biblical time, what we might now expect are more "normal" cycles (in historical terms), which put a little better means shorter ones with more frequent recessions. "Given all we know about the ‘debt supercycle’, it is likely that the onset of the Global Financial Crisis ended the “Great Moderation” period. Unless we find a way of continually adding more debt at an aggregate level in the Developed World it is likely that we will see much more macro volatility and more frequent business cycles going forward. Given the fact that Developed World Government balance sheets are under pressure, and given that interest rates around the Western World are close to zero, the post-crisis ability to fine tune the business cycle is extremely limited. We may need to put an immense amount of faith in the experimental force of Quantitative Easing to deliver economic stability. This will be an experiment with little empirical evidence as to how it will turn out. For now the base case must be that we revert more towards business cycles more consistent with the long-term historical data". So then our authors do their calculations concerning the average length of US cycles since 1854 in order to make a rough estimate of when the next few US downturns will start, as illustrated in the following chart. Now, without dwelling on the gory details, if we look at the spread between the upside, median, and downside cases, we could pretty rapidly come to the conclusion that the next US recession has a high probability of starting sometime between next summer, and the summer of 2012 - which, as you will appreciate, isn't that far away. I am also pretty damn sure that Ben Bernanke and his colleagues over at the Federal Reserve appreciate this point only too well, and hence their imminent decision on more easing, since a recession hitting the US anytime from next summer will really come like a jug of very icy water on that very fragile US labour market, not to mention the ugly way in which it might interact with the US political cycle. I think the mistake many analysts are making at this point is basing themselves on some sort of assumption like, "if the recession was deep and long, then surely the recovery should be just as pronounced and equally long", but, as the DeutscheBank authors bring to our attention, business cycles just don't work like that. Now, why I think this is an interesting argument is that the starting point for looking at the recovery is rather different from the norm, in that instead of peering assiduously at the latest leading indicator reading, they do a structural thought experiment, and work backwards from the result. Now, one thing I'm sure Ben Bernanke isn't is stupid, so it does just occur to me that either he, or someone on is team, is well able to carry out a similar kind of reasoning process. In fact, it would be an understatement to say that the forthcoming QE2 launch is causing a great deal of excitement in the financial markets. As the news reverberates around the world, it seems more like people are getting themselves ready for some kind of "second coming". Right in the front line of course are the Europeans and the Japanese, and the yen hit yet another 15 year high (this time of 81.11 to the dollar) during the week, while the euro was up at 1.4122 at one point. Greeks, where are you! Can't you engineer another crisis? We need help from someone or we will all capsize in the backwash created by this great ocean liner as it passes. But joking aside, a weaker USD is going to be both the natural and the intended consequence of the coming bout of additional QE by the Fed, and it will have a strong collateral effect on the already weaked and export dependent economies of the EuroArea and Japan. With this prospect as the background, it should not come as a surprise that talk of currency wars and competitive devaluations is rising by the day. Japan only last week threatened "resolute action" against China and South Korea, Thailand has placed a 15% tax on bond purchases by non resident investors, and central banks from Brazil to India are either intervening to try and keep their currency from rising too fast, or threatening to do so. And the seriousness of the situation should not be underestimated. Many have expressed disappointment that the recent IMF meeting couldn't reach agreement, and hope the forthcoming G20 can do so. But really what kind of agreement can there be at this point, if the real problem is the existence of the ongoing imbalances, and the inability or unwillingness of the Japan's, Germany's and China's of this world to run deficits to add some demand to the global pool. Push to shove time has come, I fear, and if this reading is right then it is no exaggeration to say that a protracted and rigourously implemented round of QE2 in the United States could put so much pressure on the euro that the common currency would be put in danger of shattering under the pressure. Japan is already heading back into recession, as the yen is pushed to ever higher levels, and Germany, where the economy has been slowing since its June high, could easily follow Japan into recession as the fourth quarter advances. Indeed, I think we can begin to discern the initial impact of the QE2 induced surge in the value of the euro in the August goods trade data. 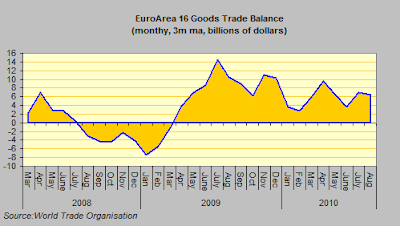 The EuroArea 16 have been running a small external trade surplus in recent months, and to some extent the surplus has bolstered the region's growth. It is this surplus that is now threatened by the arrival of the QE2. The first flashing red light should have been the news that German exports were down for the second month running in August, but now we learn from Eurostat that the Euro Area ran a trade deficit during the month. 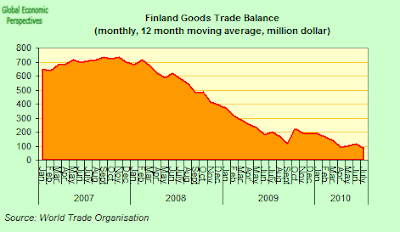 "The first estimate for the euro area1 (EA16) trade balance with the rest of the world in August 2010 gave a 4.3 bn euro deficit, compared with -2.8 bn in August 2009. The July 20102 balance was +6.2 bn, compared with +11.9 bn in July 2009. 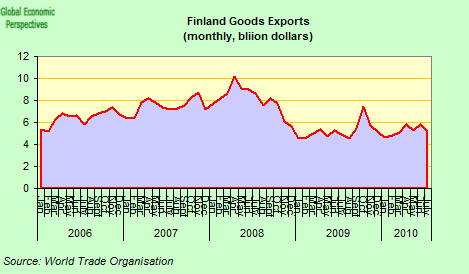 In August 2010 compared with July 2010, seasonally adjusted exports rose by 1.0% and imports by 1.8%". Basically the eurozone countries had been managing to run a timid trade surplus (see chart below, which is a three month moving average to try and iron out some of the seasonal fluctuation) and this had been underpinning growth to some extent. Now this surplus is disappearing, and with it, in all probability, the growth. Maybe we won't get a fully fledged "double dip" in the short term, but surely we will see a renewed recession (and deepening pain) on the periphery and at the very least a marked slowdown in the core. In fact the current situation is extraordinarily preoccupying. We are now in the fourth year of the present crisis (however you choose to term it, the second great depression, the very long recession, or whatever) and there seems to be no sustainable solution in sight. The underlying problems which gave birth to the crisis are excessive debt (both private and public) and large global imbalances between lender and borrower countries, and neither of these issues has so far been resolved, nor are there proposals on the table which look capable of resolving them. And unemployment in the United States (which is currently at 9.6%, and may reach 10% by the end of the year) is causing enormous problems for the Obama administration. The US labour market and welfare system are simply not designed to run with these levels of unemployment for any length of time. In Japan the unemployment rate is 5.1%, and in Germany it is under 8%. So people in Washington, not unreasonably ask themselves why the US should shoulder so much extra unemployment and run a current account deficit just to maintain the Bretton Woods system and the reserve currency status of the US Dollar. My feeling is that the US administration have decided to reduce the unemployment rate, and close the current account deficit, and that the only way to achieve this is to force the value of the dollar down. That way it will be US factories rather than German or Japanese ones that are humming to the sound of the new orders which come in from all that flourishing emerging market demand. I think it is as simple and as difficult as that. The problems created by the way the crisis has been addressed now exist on a number of levels. In emerging economies like Brazil, India, Turkey and Thailand, ultra low interest rates in the developed world are creating large inward fund flows which are making the implementation of domestic monetary policy extremely difficult, and creating sizeable distortions in their economies. At the same time, a number of developed economies like Spain, the United States, the United Kingdom became completely distorted during the years preceding the crisis. Their private sectors got heavily into debt, their industrial sectors became too small, and basically the only sustainable way out for them is to run current account surpluses to burn down some of the accumulated external debt. Traditionally the solution to this kind of problem would be to induce a devaluation in the respective currencies to restore competitiveness, but in the midst of an effectively global crisis doing this is very difficult, and only serves to produce all sorts of tensions. As Krugman once said, "to which planet are we all going to export". At the same time, two of the world's largest economies - Germany and Japan - have very old populations, which effectively means (to cut a long story short) they suffer from weak domestic demand, and need (need, not feel like) to generate significant export surpluses to get GDP growth and meet their commitments to their elderly population. The very existence of these surpluses also produces tensions, and demands for them to be reduced. But this is just not possible for them, and Japan is the clearest case. For several years Japan benefited from having near zero interest rates and becoming the centre of the so-called global "carry trade", which drove down the currency to puzzling low levels, and made exporting much easier. Large Japanese companies were even expanding domestic production and building new factories in Japan during this period (a development which had Brad Setser scratching his head at the time, trying to work out how the yen could have become so cheap). Then the crisis broke out, the Federal Reserve took interest rates near to zero, and the United States became the centre of the carry trade. The result is that every time the Fed threatens to do more Quantitative Easing the yen hits new 15 year highs, even while the dollar continues its decline, with the result that Toyota are having a change of heart, and are now thinking of closing a plant in Japan to move it to Mexico. The present situation is just not sustainable for Japan, which is basically being driven back into what could turn out to be quite a deep recession. Unfortunately I think there is no obvious and simple solution to these problems. As we saw in the 1930s, once you fall into a debt trap, it can take quite a long time to come out again. You need sustained GDP growth and moderate inflation to reduce the burden of the debt, and at the present time in the developed world we are likely to get neither. In the longer term, the only way to handle the presence of some large economies which structurally need surpluses is to find others who are capable of running deficits, but this is a complex problem, since as we have seen in the US case, if the deficit is too large, and runs for too long, the end result is very undesireable. Basically the key has to lie in reducing the wealth imbalance which exists between the developed and the developing world, but this is likely to prove to be a rather painful adjustment process for citizens in the planet's richer countries, so policy makers are somewhat relectuntant to accept its inevitability. Basically, the structural difficulty we face is that all four major currencies need to lose value - the yen, the US dollar, the pound sterling and the euro - and of course this basically is impossible without a major restructuring of what has become known as Bretton Woods II. The currencies which need to rise are basically the yuan, the rupee, the real, the Turkish lira etc. But any such collective revaluation to be sustainable will need to be tied to a major expansion in the productive capacity of the economies which lie behind those currencies. In fact, the failure to find solutions is increasingly leading to calls for protectionism and protectionist measures. The steady disintegration of consensus into what some are calling a "currency war" is, as I said above, another sign of this pressure. On one level, the move to protectionism would be the worst of all worlds, so I really hope we will not see this, but if collective solutions are not found, then I think we need to understand that national politicians will come under unabating pressure from their citizens to take just these kind of measures. The likely consequence of them succumbing to this pressure, which I hope we will avoid, would be another deep recession, possibly significantly deeper than the one we have just experienced. And, not least of the worries, the future of the euro is in the balance at the present time. The structural imbalances which we see at the global level, between say China and the United States, also exist inside the eurozone, between Germany and the economies on the periphery (Ireland, Portugal, Spain, Italy, Greece). These latter countries failed to take advantage of the opportunities offered by the common currency to carry out the kinds of structural reform needed to raise their long run growth potential, and instead they simply used to cheap money available to get themselves hopelessly in debt. At the same time the crisis has revealed significant weaknesses in the institutional structures which lie behind the monetary union, weaknesses which go way beyond the ability of some members to fail to play by the rules when it comes to their fiscal deficits. Steps are now being taken in a night-and-day non-stop effort to try to put the necessary mechanisms in place, but it is a race against the clock, and it is not at all guaranteed that the attempt will be succesful, especially if the volume of liquidity about to hit the global financial system drives the euro onwards and upwards beyond supportable limits. Just to follow up on my recent long Estonia post, a couple of new data points have caught my attention recently: the sharp rise in Estonian inflation and the ongoing goods trade deficit. 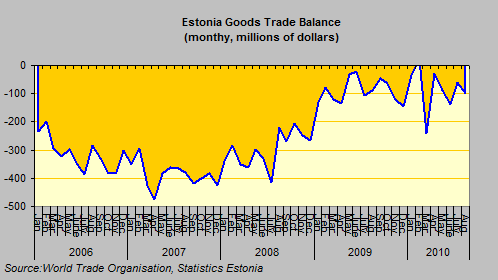 In the first place it is worth noting that Estonia's trade deficit went UP again in August. Of course, the countries ongoing services surplus takes some of the edge off, by, since Estonia is now an export driven economy, to return to stable growth and create that much needed employment Estonia needs a trade surplus, not a deficit. Of course, the headline catcher is that August's export were up 37% over August 2009. The number looks a little less impressive when you notice that imports were also up by 34%, and take in that a significant proportion of exports are imports which are re-exported, and then you look at the chart (below) and see that both are still running at levels well below their pre crisis peaks. To add insult to injury, despite the rapid export rise, Augusts trade deficit - some 71 million euros - actually increased slightly when compared to August of the previous year. 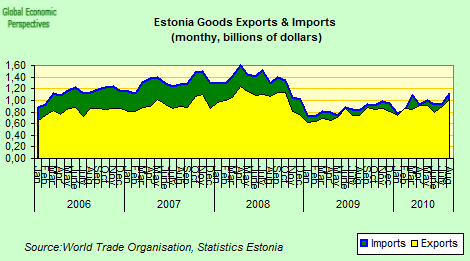 And here's the smoking gun which can help us understand why, despite the legendary "internal devaluation, the underlying Estonian trade deficit continues: the ongoing surge in inflation, itself in large part a by-product of the tax increases and energy subsidy reductions made to keep the fiscal deficit under control . According to Statistics Estonia, the consumer price index was up by an annual 4.0% in September, and by 0.8% when compared to August this year. Goods were up 4.5% and services 3.0%. Food prices were part of the problem, since they were up 7.0%. But, as the statistics office report informs us, government administered prices of goods and services were up by 8.1% while non-regulated prices were only up by 2.7% - that's the giveway datapoint, I think. Two fifths of the inflation was the result of a 6.6% price increase in food and non-alcoholic beverages, but the 10.2% price increase of electricity, heat energy and fuels accounted for 25% of the total, and the 8.2% excise duty induced price increase in alcoholic beverages and tobacco also had a significant impact on the consumer price index. So inflation is rising, but even worse, so too are inflation expectations. Inflation expectations by Estonian consumers continued to rise in September, according to Konjunktuuriinstituut, an economic research institute in Tallinn. The outlook is “certainly” affected by the prospect of euro adoption, the institute said. Thirty-five percent of consumers polled by the institute this month expect inflation to accelerate in the next 12 months, compared with 32 percent in August, and 5 percent a year earlier, it said. So, if those taking the policy decisions aren't careful Estonia may be about to loose its "poster boy" image, and find itself added to the ranks of the "fallen angels". 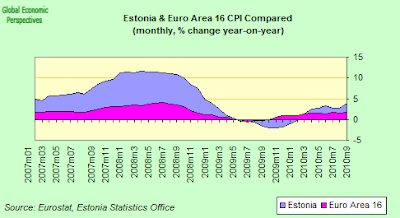 The above comparison of Euro Area 16 and Estonia CPI inflation makes it look awfully like the timing of the tax and subsidy changes was calculated to get good inflation readings during the key euro decision window. It is hard to believe that neither the central bank nor the ECB could see the current surge coming - or if they couldn't, then the best you could say is that they were extraordinarily incompetent in their handling of the issue. 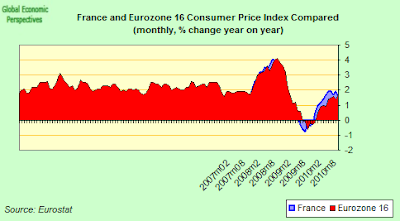 And if you look at the competitiveness loss the price index reveals since the start of 2007 (even) the short period of deflation has nowhere near compensated for it, and the current price surge will soon eat it what little competitiveness improvement there has been all away. Of course, the central bank has expressed some concern, “There is a threat the present price and wage levels will not sufficiently support new investment and job creation,” it said in its latest economic report, although it stressed that it considered the increase in ongoing inflation due to rising food prices is likely to be temporary. All of which only confirms my impression that the Estonia entry decision was made in haste, coinciding as it did with May's sovereign debt crisis. The decision was a kind of vote of confidence in the resilience of the Euro Area: "look, we aren't about to fall apart, we're even accepting new members". In fact ECB President Jean-Claude Trichet almost said as much on a recent visit to Tallinin. Europe's economic and monetary union is committed to accepting further members, he stressed. "The euro area is not a closed shop," M. Trichet said, while attending a festive event to celebrate Estonia's upcoming accession to the eurozone. Rather, he said, it is open to any country "that fulfills any of the preconditions in a sustainable manner." The keyword here is "sustainable". As reported on this blog, there were those within the ECB, and most notably ECB executive director Juergen Stark, who opposed the decision, by simply arguing that, in the light of Greece's inability to endure the discipline of EMU membership, future applicants should be screened more tightly. In the past, membership had rested on the ability to conform with numerical targets on inflation, public debt and exchange rate at a specific point in time. Stark spoke of the need for countries to demonstrate that their compliance with the entry criteria is sustainable beyond the snapshot moment. As we can see, at least in terms of inflation, it is very hard to argue that Estonia's economic performance is. Jean-Claude Trichet also took advantage of his visit to stress that Estonia must remain “alert” on price developments and take “forceful” action to stem inflation after joining the euro-region economy. But, understandably, Prime Minister Andrus Andrip replied that Estonia is now going to have relatively “few tools” to control price increases. 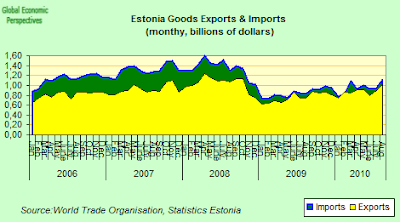 The main technique available is to run a fiscal surplus to drain demand, but with an economy which is suffering from the level of output loss that Estonia's is this is hardly contemplateable. Basically it would have been much more advisable to resolve these issues before joining the euro, but now it is a little late for that, so, who knows, maybe Estonia will eventually become the first candidate for the recently proposed EU imbalances surveillance mechanism. As the press release puts it: "The global economic and financial crises, followed by the so-called debt crisis, exposed the need for reinforced economic governance in the Economic and Monetary Union (EMU). Economic policies need to be better co-ordinated and surveillance enhanced". "Surveillance would start with an alert mechanism that aims at identifying Member States with potentially problematic levels of macroeconomic imbalances. The alert mechanism would consist of a scoreboard complemented by expert analysis". "The scoreboard would be composed of a set of indicators in order to identify timely imbalances emerging in different parts of the economy. The set of indicators should be sufficiently large to cover any possible case of major imbalance and making sure that it is sufficiently sensitive to detect imbalances early on. Possible indicators would most likely include both external (e.g. current accounts, real effective exchange rates) and internal ones (e.g. private and public sector debt). The composition of the scoreboard may evolve over time due to changing threats to macroeconomic stability or advances in data availability". "Alert thresholds would be defined and announced for each indicator. The thresholds should be seen as indicative values which would guide the assessment but should not be interpreted in a mechanical way. They should be complemented by economic judgment and country-specific expertise". But looking at that rising inflation profile, and thinking of Prime Minister Ansips statement that the country has few tools left with which to tackle the problem, whoever would have thought that just a few short years ago Lithuania had its application to join the Euro turned down simply because its inflation wasn't considered to be sufficiently under control. My, my, how things change. On account of its 2.63% March 2006 inflation, Lithuania has for now failed to qualify for the euro zone, while Slovenia is all set to adopt the euro in January 2007. Lithuania meets all the criteria for the adoption of the common European currency, except for the one on inflation. The Baltic state's latest inflation figure is only marginally higher than the 2.60% benchmark applied by the Commission and the European Central Bank to decide whether a country is fit to adopt the common European currency. According to Monetary Affairs Commissioner Joaquin Almunia, the criteria, laid down in the EU's Stability and Growth Pact, are there to be rigorously enforced. Is A 6 percent 2011 Deficit Realistically Within Reach For Spain? Last Thursday Moody's Investor Service cut Spain's Sovereign credit - to Aa1 from AAA - thus removing the last of the country's highly-valued triple-A ratings. The move really surprised no one - in this case the Moody's rating could be regarded as a lagging indicator on the health of Spain's finances - since the two other "majors" (S&Ps and Fitch) had long taken the decision, and the market predictably shrugged off the news, as if to say "what else is new". But there was one small detail in the report which should have attracted more attention than it has: the agency explicitly stressed that it was the government's show of determination to reduce its very large fiscal deficit in the near term which influenced their decision to limit the downgrade to just one rating notch, and this was also the reason the rating had been assigned, for the time being, a stable outlook. Which means, of course, that should there be any slippage in that determination, any wearying, or falling asleep at the wheel, then the outlook would rapidly move to negative, and more downgrades could be anticipated. This creates an interesting situation, since I am by no means as convinced as many conventional journalists seem to be that the present fiscal situation is entirely under control. And since I do think Spain is going to come under increasing scrutiny from all points of view as we enter 2011, especially if Ireland and Portugal are ultimately forced to seek some sort of financial rescue, then any "accidental" slippage this year will inevitably mean even deeper cuts and a lot more pain next year, since Elena Salgado and José Luis Zapatero very definitely have pinned their shirts to the mast on the question of getting the deficit down to 6% of GDP in 2011. If this target is not achieved, and in a way which satisfies reasonably close inspection, then I think the country really will face the wrath of the markets, and in this sense the destiny of the 46 million odd people who live in the country very much is harnessed to the credibility and realisability of the budget plan Elena Salgado is about to present to the Spanish parliament. 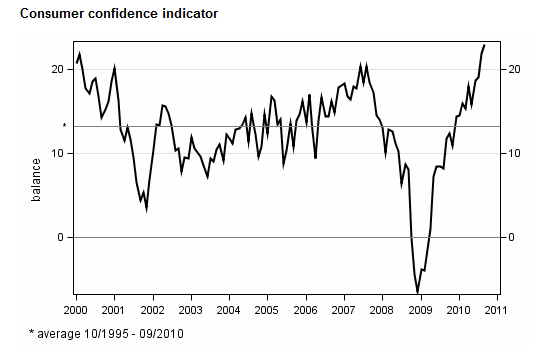 According to most of the reports you read in the press these days market confidence in Spanish debt is rising based on the growing conviction that the Spanish government will be able to comply with its deficit commitments. I somehow doubt that this is the complete story (as I explained in this post), and think it is as much a case of markets being focused at this point on whether or not Ireland and Portugal will ultimately be forced to have recourse to the European Financial Stability Facility (EFSF), and that they are being detached from Spain as much as Spain is detaching itself from them. At this point in time Spain is simply in the waiting room, in a state of grace or being given one last chance, and if the opportunity is not clearly seized with both hands then downgrades and widening spreads will almost certainly follow. Now, according to the "official version" what is happening if that Spain's fiscal deficit is steadily coming nicely under control as the economy returns to growth and the government squeezes its spending harder and harder. There are only two difficulties with this story. In the first place Spain's economy already appears to be moving back into contraction (the Bank of Spain is now talking of a "weakening" of GDP in the third quarter, and only last Friday the government itself revised up its unemployment forecast for 2011, from 18.7 percent to 19.3 percent to reflect the way the impact of the spending cuts is expected to hit growth). Indeed Moody's itself stressed their scepticism over the government's growth forecast. “Over the next few years the Spanish economy is likely to grow by only about 1 percent on average,” according to Kathrin Muehlbronner, a Moody’s vice-president and lead analyst for Spain. And this is more optimistic than S&Ps, who seem to think trend growth in the years to come will be more like 0.7 percent. Secondly, and this is the important point at this stage, the part of the deficit which is apparently reducing at this point is the central government one: we are simply not being given the necessary information on the state of Autonomous Community and Local Authority finances to know whether their deficits are reducing, or even if they are increasing. Spain's central government has targeted a deficit of 6.9 percent of GDP this year, with the rest of the adminstration being supposed to limit themselves to 2.4 percent to bring in the 9.3 total promised to the markets. So despite the fact that we only really have limited information at this point, here is how Reuters reported the news. MADRID, Sept 27 (Reuters) - Spain's central government budget deficit fell more than 40 percent for January to August compared with the same period last year, thanks to a higher tax take, leaked data from the Economy Ministry showed on Monday. The January-August deficit, which does not include the balances of the social security system or provincial governments, would be equivalent to 3.3 percent of GDP. Spain has promised to cut the public deficit to 6 percent in 2011 and to an EU-guideline of 3 percent in 2013 -- forecasts many economists have said they doubt are possible in a low-growth environment. The central government deficit in the first eight months of the year totalled 34.85 billion euros ($46.50 billion), data from the ministry published on the website of financial newspaper Expansion showed. That was 42.2 percent lower than the same period last year. The improvement was helped by a 33.4 percent higher tax take, buoyed by a 2 percentage-point rise in value-added tax from July 1. Still, the January-August figure marks a smaller improvement than that logged in the January-July period, when the deficit came to 25.77 billion euros, down 48.2 percent from the same period last year. That data was welcomed by markets who saw signs that Spain was getting its fiscal house in order. Now I am calling this the "official version", but I could, rather less charitably call it the "data engineered" one - since the people who are circulating it either don't understand how to read the official monthly updates on bugdet implementation, or they are intentionally trying to mislead. As I will try to show below, the sort of story being reported by Reuters represents a very tendentious reading on the numbers to say the least, since when you come to look at the fine print the real underlying deficit is not down over 40 percent from last year, the tax take is not up 33.4 percent on 2009, and the VAT increase is not having its effect (yet) since as the Agencia Tributaria (Spain's tax office) explain in their report, due to the August holiday period they haven't even processed the returns yet, and the only item they have data for is VAT paid on imports - which has brought in an estimated 100 million euros extra so far. "Julio y agosto recogen los primeros impactos recaudatorios de la subida de tipos, pero sólo en el IVA Importación, que se valoran en unos 100 millones (0,8% del incremento total)." Agencia Tributaria - August report. So, what we have is not a lie, or even a damn lie, but it is a very studied and judicious use of the statistical data available. Put politely, the data we have been served seems specifically designed to confirm the idea that Spain is, finally, getting its fiscal house in order. Unfortunately, this is not the complete picture. What we are getting is the truth, and nothing but the truth, but what we aren't getting (yet) is the whole truth. As I say, the detail here, as always, is in the fine print, although the big point - that we don't know about regional government spending - really should be very obvious to anyone who is even vaguely aware that Spain is a fairly decentralised state, and thus it should stand out like a smoking gun that in all the articles you read about the deficit, the reference is to Spain's "central government" deficit, conveniently forgetting that a significant part of the total - and this year probably an even larger part than normal - comes from the regional governments and the municipal authorities - as I have already tried to explain in this earlier post. If we have leaned anything about Spain during the present crisis it surely is that nothing, but absolutley nothing that is to be found in a government press release should be accepted at face value without further checking. 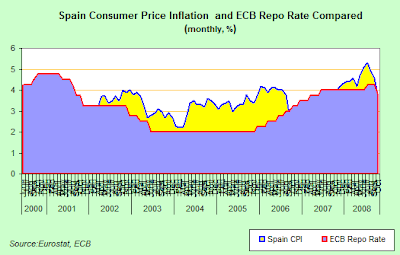 I don't think Spain's government simply blatantly and obviously falsifies its data, but I do think that data is often presented in a way which, if you don't follow all the methodological procedures which lie behind it, can give a totally misleading impression about what is going on, and I am not convinced that this outcome is completely unintentional. Luckily for us however, the body which is responsible for following the progress of the annual government budget as it is implemented - a very austere sounding entity known as the Intervención General de la Administración del Estado (or IGAE) - publishes a fairly readable and easy to understand monthly report (latest issue available here), and if more journalists who wish to report on Spain took the trouble to read and study it for themselves, then perhaps they wouldn't be so easily taken in by the latest government press handout as they evidently have been up to now. The first thing to note, as the IGAE themselves emphasise is that when it comes to following the annual execution of the budget it is important to compare like with like, and not, as it has become fashionable to say these days - apples with pears. In this case we need to distinguish between harmonised and non harmonised accounts. That is to say, when there has been a methodological change which influences the data the raw numbers (which you can find on page 9) can be very misleading, and you need to follow the harmonised data (which you can find in page 11). Thus, the raw data suggests that indirect taxes (impuestos indirectos) were up by 39.9% between January and August when compared with the previous year (seventh row, end column), while the harmonised (or adjusted) figure is 29.9% - meaning the real improvement is only 8.049 billion euros, and not 13.164 billion the raw number suggests. But even this is not the complete picture, since if we now go to the latest monthly report (here) from Spain's Agencia Tributaria (the tax office), we find (page 16 in the acrobat reader), that one of the big differences in the VAT numbers between 2009 and 2010 comes from the much smaller volume of refunds in 2010. Refunds fell from 43.525 billion euros in the first 8 months of 2009 to 33.087 billion in the same period of 2010, that is to say by 10.438 billion euros. In their methodological commentary the Agencia Tributaria (on page 5) put this reduction in refunds down to either money owing from previous fiscal exercises (4.4 billion euros) or refunds which had already been paid in 2009 (5.6 billion euros) due to a policy change which meant that refunds started to be made on a monthly basis. Be all that as it may, the real net increase in tax income from all sources so far this year is something like 6.9 percent according to the agency, and the net increase in IVA (adjusted for refunds) may be more like 5.4 percent, and not the splendid looking 47.5 percent figure which appears on page 11 of the IGAE report. Las devoluciones de IVA Anual 2009 caen hasta agosto un -60,9% (en consonancia con el menor importe solicitado), y las de IVA mensual apenas crecen un 0,3% porque las mayores devoluciones realizadas este año del ejercicio 2009 (por la generalización del sistema de devolución mensual) se compensan con el menor importe solicitado del ejercicio 2010. La única novedad que aporta agosto en cuanto a los ingresos brutos es el IVA Importación, que registra un aumento del 18,0% hasta este mes en sintonía con la marcha de las importaciones de terceros no energéticas. En total y antes de empezar arecoger el impacto total de la subida de tipos, el IVA bruto ya acumula un incremento del 5,4%. Agencia Tributaria Report, my emphasis. Now, if we move over to the expenses side, we see that staff costs are up (2.3 percent) in the first eight months of the year, but this number is a little deceptive, since salaries were originally increased 3 percent in January of this year, and then cut in the May measures by an average of 5 percent as of 1 July, so evidently as the year advances the total increase should fall steadily, and may even arrive below zero by the end of the year. 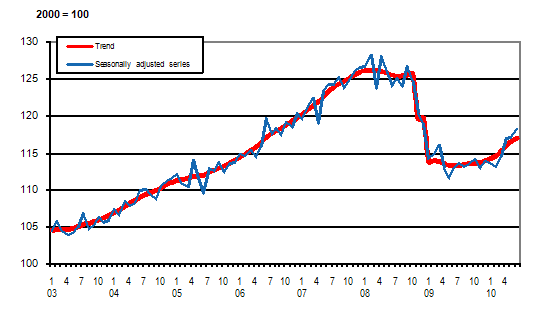 More importantly (for next year) freezing salaries for 2011 will represent a real reduction in salary 2011/2010 since the base to be applied on 1 January 2011 will be the level of 1 July 2010, which means during the year their will be a commensurate drop in Spanish domestic consumer demand. But the big reductions on the spending side for 2010 come in capital spending (infrastructure works etc) which is down 7.9 percent (or 500 million euros, about 0.05 percent of GDP), and in transfers to Spain's local authorities - which are down by around 1.3 billion euros (or about 0.13 percent of GDP). Transfers to the autonomous communities are in fact up, but interpreting this involves a complicated calculation, since there have been recent changes in the financing arrangements. On the other hand, Spain's regional governments, far from reducing their deficits are in fact increasing them like never before. 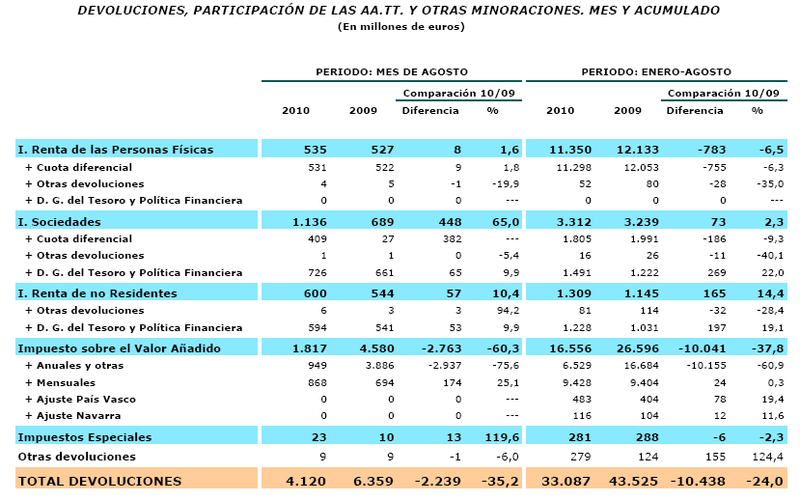 In fact total autonomous community debt hit 104 billion euros (0r 10.4% of GDP) in June according to the latest Bank of Spain data, up from 82.9 billion one year earlier. That is to say, the regional governments increased their debt by nearly 25% year on year, and there is no sign so far that they are putting the brakes on. Of course, the regional governments only accounted for about 14% of last years deficit, so even if their deficit does shoot up, it won't be a determining factor, but it will make it much more difficult for the total deficit to fall within the targeted limits. The local authorities, on the other hand, have things a lot tougher, since their revenue from central government is significantly down, and they find it very hard to increase their borrowing from banks, so their rate of new debt accumulation is definitely slowing. On 4 August 2010 Fitch Ratings placed four more Spanish autonomous communities on a Negative Rating Outlook, which effectively meant that all Spain's autonomous communities are now on Negative Outlook. According to the rating agency this move reflects their view that their budget balances will remain fragile in the medium term, while their debt will continue to increase. As they say, some indication of regional governmment intentions to curb expenditure have emerged, but in the majority of cases the measures still need to be detailed and implemented, a process which could take considerable time, and will certainly see us well beyond the 2010 fiscal exercise before their impact is felt. According to the terms of the recent Royal Decree the maximum deficit allowed for the Autonomous Communities during the 2010‐2012 period has been reduced by 0.5% of GDP. But this decision comes just one year after the Council for Fiscal and Financial Policy (CFFP) authorised the autonomous communities to exceptionally raise their deficits to 2.5% of the GDP for 2010, 1.7% for 2011 and 1.3% for 2012 in order to counterbalance the revenue shortfall being created by the crisis. So we can imagine some kind of chaos may well have ensued when those responsible for implementing their budgets learnt of the new targets. What is worse for the regional governments, as Fitch point out, the smaller deficit allowances introduced in June 2010 do not take into account the negative tax settlements related to excess transfers made by the state during 2008 and 2009 to try to help the beleagured regional governments. Although the amount of this excess funding temporarily transferred to autonomous communities by the central government has yet to be confirmed it is clear that now having reduced entitlement to funding will only make an already difficult position worse. What happened was that the 2008 and 2009 budgets’ tax forecasts were over‐optimistic and the autonomous communities received greater advance tax and sufficiency fund payments than warranted by the amounts actually collected, and the autonomous communities will now have to return the excess (see chart from Fitch below). Fitch’s calculates that the excess allocated to autonomous communities in 2008 was something like 7 billion euros, and that in 2009 the number may have hit 21 billion euros. According to the new financing agreement with the central government, the regional governments can make repay in 60 monthly instalments starting in January 2011. Fitch is of the opinion that the increased financial pressure all this will produce plus the stricter control over debt authorisations introduced under the new financing agreement will definitely create heightened liquidity pressure for the regional administrations. Most of the autonomous communities have budgeted for a deficit equivalent to 2.4% of their GDP for 2010, however, since the central government is now only likely to authorise them to issue new debt equivalent to a maximum of 1.95% of GDP, they will have to fund a gap equivalent to a minimum of 0.45% of GDP without new borrowing. The most likely scenario is that their cash reserves will decline and that delays in paying suppliers will increase. And to make matters worse, significant doubt exists about the achievability of Spain's GDP growth forecasts. Finance Minister Elena Salgado said last Friday that she was confident the country's economy would grow in line with government forecasts but most analysts feel the forecasts of a 0.3% contraction this year,followed by growth of 1.3% in 2011, 2.5% in 2012 and 2.7% in 2013 are far too optimistic. And, of course, if all this wasn't enough, even if the fiscal effort is made as the government is promising, this still doesn't solve the deep-seated underlying problem. Just what is the plan to put sufficient dynamism back into the Spanish economy in order to produce those lovely growth numbers that we would all so much like to see? According to an intriguing article I read in Bloomberg recently an alert signal has been sounded due to the fact that house prices in the Scandinavian countries have been rising very rapidly of late. Judging by what they explain what is now going on in the housing markets of Norway, Sweden and Finland would seem to have all the hallmarks of a "mini-bubble", one which is all the more perplexing given the lowish level of economic activity which characterises the current environment. But then I asked myself, and those whopping German export numbers we saw in the second quarter, wheren't they also some kind of "mini bubble" which was quite out of keeping with what we should expect to be seeing. Worse, if this seeming Scaninavian bubble were to pop, it could well send what has up to now been among the strongest regional rebounds on the whole European continent straight into a nosedive. 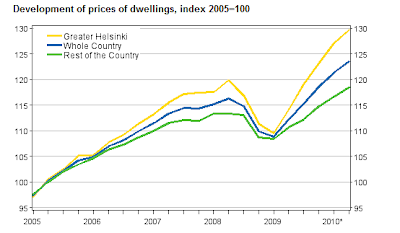 In particular the Finnish problem interests me, house prices are rising steadily, and with them construction activity, even as the economy in general remains severely depressed following one of the sharpest output falls to be found in the Eurozone. The central cause of the problem is not hard to pin down, it is to be found the widespread recourse to variable rate mortgages, which make activity in the housing sector (and through it the economy as a whole) highly sensitive to short term movements in interest rates . About 95 percent of mortgages in Finland and Norway follow money-market levels, while about 60 percent of Swedish loans are based on adjustable rates. This exposure to variable rates mirrors closely the situation in Spain and compares with that in Germany where some 90 percent of homeowners make fixed interest payments, or in France where the percentage of fixed rate mortgages is slightly less than in Germany but substantial nonetheless. Really I'm rather surprised that more of the experts on our financial systems haven't made this variable rate boom/bust behaviour connection during the recent debate. Anyway what this flexible rate exposure means is that last the record low borrowing costs which are available in European money markets have simply fed straight into the Nordic region housing markets - where householders were not so deeply leveraged going into the crisis as they were in Spain or Ireland - and it has done so much faster than in it has in other parts of Europe. France would be the other country to watch (or Poland) but at least in France the central bank has a better hold on the situation via the insistence on a fixed rate mortgages policy. And the situation is not to be laughed at: Bloomberg quote Finnish Finance Minister Jyrki Katainen as saying he is "very worried" since in his opinion “There could be a housing bubble in the making in Finland. There is a risk that mortgage borrowing costs are too low.” My feeling is that by the time Finance Ministers start talking about the problem it is already too late. 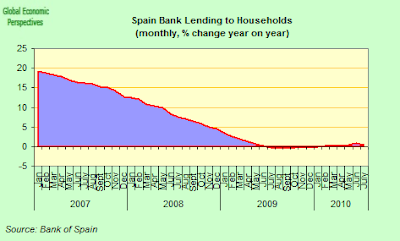 "Households’ new drawdowns of housing loans amounted to EUR 1.5 billion in August, up by 1% on July 2010 and 20% on August 2009. The average interest rate on new housing-loan drawdowns rose to 2.08% in August, from 2.03% in July. A typical housing loan drawn down in August was tied to a 12-month EURIBOR and had a maturity of 20 years. 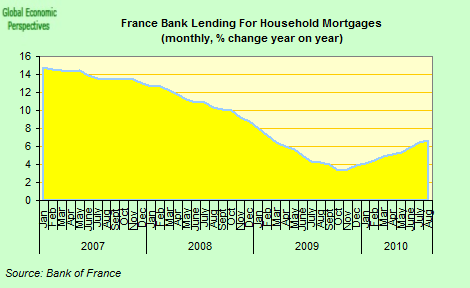 The stock of MFI housing loans to households grew by EUR 0.4 billion on July, to EUR 75.0 billion at end-August. The annual growth rate of the housing loan stock slowed to 6.7%, from 6.8% in July. 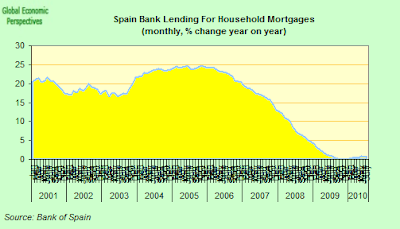 The average interest rate on the stock of housing loans rose by 0.02 percentage point from July, to 1.96%". 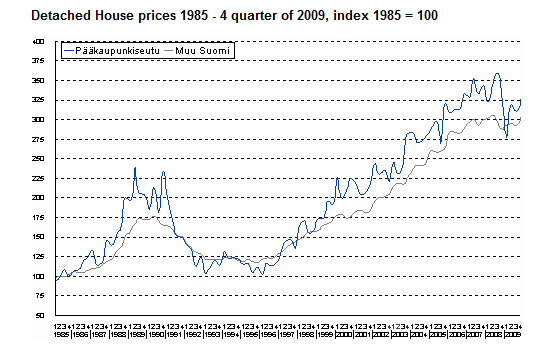 So it is true, interest rates in Finland are ultra cheap (around 2%) and the stock of mortgages is rising by nearly 7% annually: not ulta high by historic standards, but we are in the midst of, well you know. 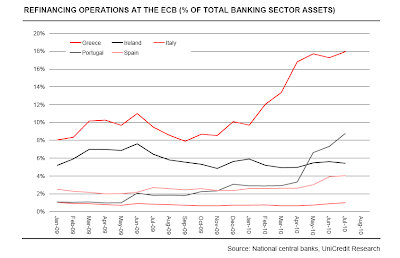 Which takes me back to my last post on imbalances in the Eurozone, and what the ECB can do to prevent a situation like the one in Finland becoming a repeat performance of what happened in Spain or Ireland. In Finland, existing flat prices rose by an annual 10 percent in the second quarter, after surging a record 11.4 percent in the first three months of the year. 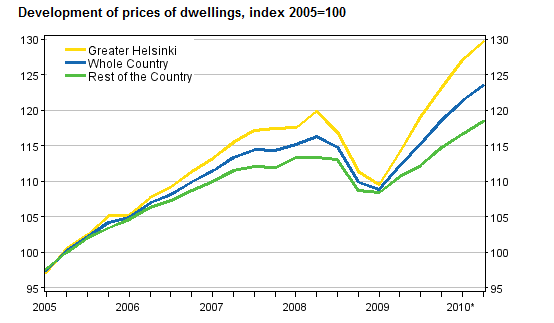 In Greater Helsinki the growth rate was 13.6 percent and in the rest of the country 7.0 percent. 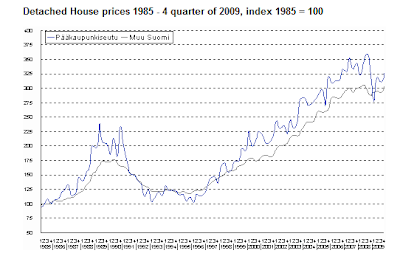 The situation with house prices is similar, since after a 1.5% fall in 2009 (with the price in large urban areas falling by as much as 8.7 percent they are now back back on their way up again. 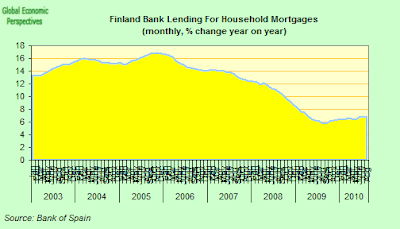 And the pressure is mounting, since household debt in Finland rose to 107 percent of disposable income at the end of last year - up from 65 percent in 2000. Which means that any significant rise in interest rates at the ECB could see many of those with mortgages having difficulties maintaining their monthly payments. What is even more curious is that all of this is taking place even while the Finish economy is a long way from emerging from the deep hole into which it fell. Finland’s GDP is expected to grow by 1.5 this year, following last years 8 percent contraction, according to a government forecast which does not seem totally unrealistic. But if we look at the chart below, which shows the GDP indicator produced by the Finnish statistics office, there is still a very, very long way to go to get back to where we were. Yet despite this, consumer confidence is at what are effectively record levels. So with all this money going into construction and consumption the Finnish economy is starting to suffer from structural distortions (heard about that before somewhere, have we?). 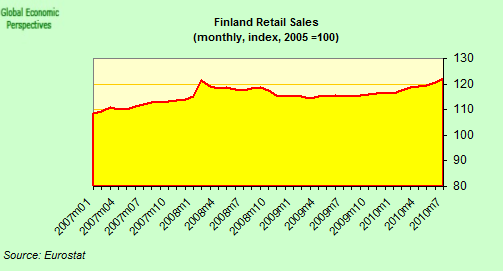 Retail sales have more or less recovered, and are now steadily moving above their pre crisis level. But industrial output is remains way down (in July it was still 23 percent from peak, and even showing signs of falling back). 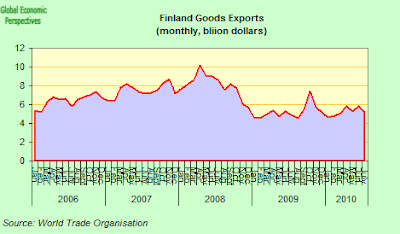 And Finnish exports have completely failed to recover. A feature which is very clearly reflected in the trade balance, which is now very near to turning negative. Competitiveness problem anyone? 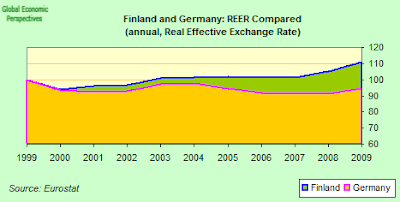 What is quite surprising is that while Finnish industry did pretty well at maintaining its price competitiveness up to 2007 (if we look at the REER chart below), it seems to have losy considerable ground in 2008 and 2009 (ie during the crisis, which seems to suggest "rigidity" rather than "flexibility"), and, of course, (to repeat the old mantra) it can no longer devalue to make an "easy" correction. So it looks like it is going to have to follow its Baltic neighbours down the hard road of a long slow internal devaluation, and especially after the bubble bursts. Of course, as others have already pointed out, this isn't simply a Euro problem, since neither Sweden or Norway are in the Euro, and they are also struggling to contain their housing markets. They are typical problems faced by a small open economy in an environment of massive external liquidity. Evidently, as Roubini Global's Mikko Forss says, tighter regulation from the Bank of Finland would have helped (I fear it is now really too late for this to be effective in the timeframe available) - controlling loan to value ratios, limiting variable rate mortgages, raising income-to-loan parameters, etc. As things stand, the main short-term threat to Finland would seem to come more from a premature raising of rates - which would surely burst the thing - rather than from keeping interest rates lower longer, and trying to implement some emergency measures. Obviously it is hard to convince a country which has just had such a sharp drop in output that even a 3.8% fiscal deficit is too high in a situation where consumer credit demand is leading the economy to become increasingly distorted, but if its pain you are worried about, then maybe a short term dose is a lot better than ending up where Spain and Ireland are. Without monetary policy tools available all the authorities can do is impose regulations and use their own fiscal spending to regulate demand. And inflation expectations and credit demand are both on their way up. According to the September consumer confidence survey, Fins expect consumer prices to increase by 2.6 per cent over the next 12 months. One year ago the predicted inflation rate was 1.6 per cent, and its long-term average is 2.1 per cent. And when asked about their borrowing intentions, 71 per cent of those questioned stated they thought this was a good time to raise a loan, while in August the proportion was 64 per cent. Hardly a surprising result, with interest rates pinned to the floor, and inflation expectations rising. So the Finnish economy does seem to be poised on the edge of some sort of cliff, and one day or another it is likely to fall. And it is precisely the existence of problems like these in a country like Finland (far from the Mediterranean beaches and sun) which leads me when thinking about the problems we have on our hands to prefer the expression Europe's periphery (from Ireland to Finland to Latvia to Hungary to Bulgaria to Slovenia to Greece and Spain and Portugal) rather than the over narrowly-focused (and somewhat abusive) term PIGS. But whichever way you look at it, and whatever you want to call them, there are a growing number of countries inside the EU who face mounting rather than subsiding problems at this point. All For One And One For All - "We AreThe Eurozone"
One of the worrying things about the handling of the current European crisis is how many of those responsible for taking the decisions seem to view the Eurozone in a way which is every bit as rigid, timeless and dogmatic as the thinking of those old school scholastics whom Galileo, in his time, found himself battling against. Rather than facilitating a dialogue, and a free and open discussion, the guardians of fortress euro seem to want to keep the doors slammed tight shut, just in case any strange and unwanted ideas should inadvertantly slip in without them noticing. 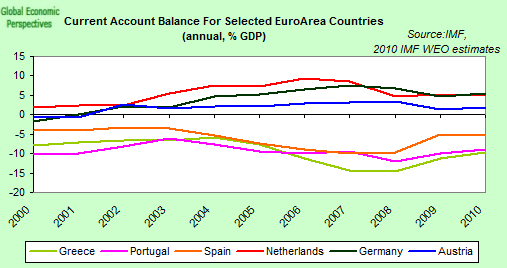 Take the issue of Eurozone aggregate data. Treating the countries that constitute the bloc as one homogenous entity seems to have become a sort of shibboleth which it is impossible to question, even though it is patently evident to all concerned that there are often enormous differences between the economy of one member country and another. Inflation is the prime example. What seems to interest members of the ECB Governing Council when they have their monthly meeting is that somewhat abstract entity, the average EU16 inflation rate, while what is obviously interesting to follow from a policy point of view (just look what happened to Ireland, Spain and Greece in the years before the crisis - see Spain chart below), is the degree to which inflation rates in individual countries diverge from the mean. 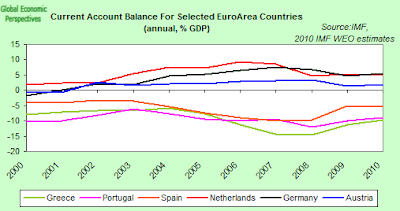 Another example would be current account balances (see chart below). Eurostat publishes data for the EuroArea 16 on a monthly basis, but I think I am right in saying they never publish the national-level breakdown (certainly I have never seen it, and that hasn't been for want of trying). But, of course, now we find ourselves with a whopping set of internal imbalances between those countries running large surpluses and those with large deficits - which the financial markets are becoming less and less willing to fund - and no one seems any too clear about what to do to restore the balance. But how were the imbalances allowed to build up in the first place? Did they creep up on us by stealth, or was no one really looking? 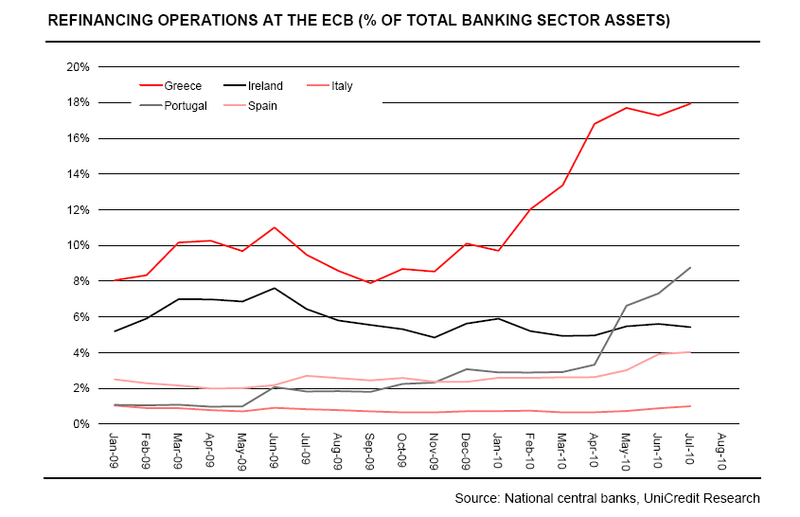 Exactly the same issue arises with the national breakdown of bank borrowing from the ECB. As if living in a theoretical cocoon, decision makers at the ECB move forward in way which makes them seem completely impervious to the problems posed by the way banks in one country are more dependent on funding than are those in others (M Trichet repeatedly refuses to answer questions on this kind of issue at the monthly press conference) and hence remain walled-in from the issues which actually exist in the real world which surrounds them. When pressed they simply state that there is no problem since an EU country is in principle just like a US state - try telling that to Ireland or Greece. Or try telling it to German voters when they are asked to contribute to bailouts. The issue is of course a very telling one, since basically the whole present Eurozone debt crisis has the inter-country imbalances as its backdrop, hard as the members of the ECB Governing Council may try to avoid admitting it, prefering instead to focus attention on the fiscal profligacy (of which, naturally, there has been a good deal) of the national members state governments. In other words, the problem is not of their making, oh deary me no! National divergences in bank lending constitute another very good case in point. Despite the fact that the current crisis has become known as a Sovereign Debt One, it isn't always fiscal spending and public sector debt which lies at the heart of the problem. In fact, private sector debt is often as much of an issue, and the private sector in some EuroArea countries is heavily indebted, while that in others is not. It is important to discover who is who here, and to distinguish between them, since if you don't it will be impossible to decide prescisely which kind of policy mix is appropriate in each and every case (but, of course, our modern scholastic dogmatists will tell us there are no such things as "cases" here, and continue to insist there should be no distinction between countries at the level of policy). Yet just when you need the fine grained detail, what you get are more aggregate numbers and a bunch of platitudes which really tell you very little. Thus, in the August edition of their publication "Monetary Developments In The Euro Area" we learn from the ECB that bank lending to euro-zone businesses increased in August by €17 billion as compared with July, a rise which more than reversed the €11 billion decline in July over June. What this increase meant was that the annual rate of decline in corporate borrowing was only 1.1% in August versus a 1.4% annual drop in July. 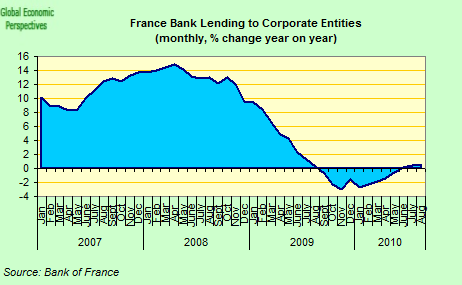 That lending to corporates is falling less rapidly is good news, but it is still falling on an annual basis. 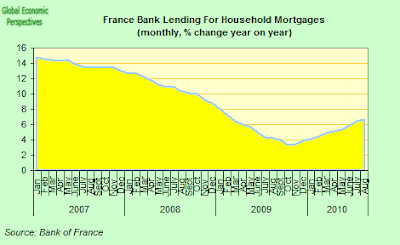 Aggregate lending to households also picked up, rising €14 billion during August compared with a €5 billion monthly increase in July. This lead the annual rate of growth to rise to 2.9% from 2.7% in the previous month, which produced a lot of "at last" type comments in the press. And putting the two numbers together, we find the annual rate of growth in loans to the entire private sector was up at 1.2% in August from 0.8% in July. Relief all round, surely, since we are going the right way. Unfortunately nothing is ever so simple, and once we start to dig down we find large and significant disparities - disparities which may well produce monetary policy decision conflicts for the ECB in the months to come - hidden away in the aggregates. In France, for example, lending for house purchases was up an annual 6.5% in August, and indeed over the last three months such lending rose at a 7.9% annualised rate (ie lending growth for housing is accelerating), while in Spain total house lending was only up 0.6% on the year (in July, we don't have the August data from the bank of Spain yet, but it won't be very different). 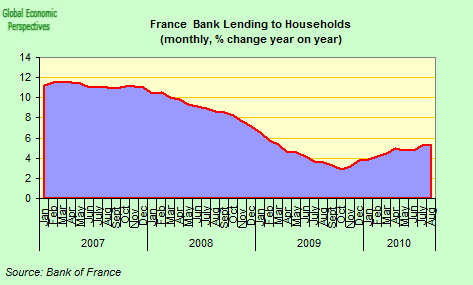 When we come to total lending to households we find the pattern repeated, since this was up 5.4% in France in August, and only 0.5% (in July) in Spain. And when we come to corporate borrowing, this was up an annual 0.4% in France in August, while it was down 1.9% in Spain (in July). 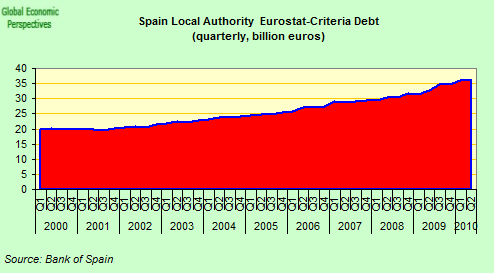 But then, you may want to ask, at the end of the day just why would anyone in Spain want to take on more debt? Since the Spanish stock of corporate debt is around 1,300 billion euros, while the French equivalent is only 771 billion euros (and the country is about half as big again as Spain), French corporates could certainly take on some more debt (if circumstances like market and investment needs warranted) but Spain's heavily over-indebted corporates simply need to pay their debt down. 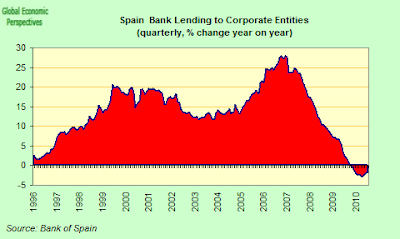 In the context of Spain's shrinking economy, more credit for Spanish corporates simply means more indebtedness and more interest-roll-up loans of the kind that "gather no loss" (at least at the balance sheet level), hardly a desireable development at this point. Evidently I have taken the two polar cases here, borrowing in Italy and Germany is much weaker than in France, while the situation in Ireland, Greece and Portugal will look more like Spain. But this is part of the point, France is the one large EuroArea country where domestic demand still has real life to it (for a variety of reasons it wasn't blown out by a bubble during the last round) but for just that very reason it would be absolute madness to turn the goose that can still lay golden eggs into some kind of "foie gras" by feeding it up with massive doses of liquidity it evidently doesn't need. Looking at the inflation differential between France and the Eurozone average matters aren't getting out of hand yet, although French inflation is above the average in a way in which it has not been before, and the situation now requires careful monitoring. 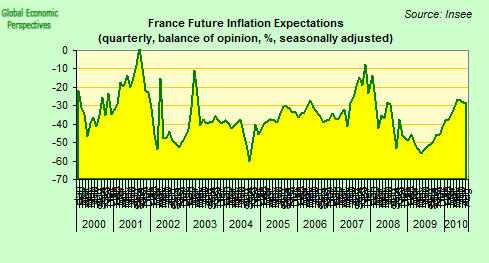 Forward looking inflation expectations have risen in France in recent months, but they seem to a stagnated of late, so again, at this point there is no need to panic. But the situation is one where - now what is the expression - "extreme vigilance" needs to be exercised, since naturally there is no reason why a country that didn't have a bubble last time round won't develop one next time. So perhaps one of you journalists who attend the post-meeting press conference might like to ask M Trichet whether this is the kind of approach he has in mind, and what policy options are open to him should the worst case scenario (on the upside) really start to materialise. In the meantime, all I can do is shrug my shoulders and mutter under my breath "ma eppur si muove".